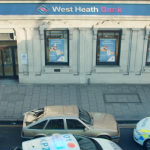 It was filmed at the former bank, called West Heath Bank in the ad, where a hapless robber races in with a banana tucked inside a sock, demanding all the money. FilmFixer manages the film office service for Croydon. FilmFixer director Andrew Pavord says, “This is a very endearing use of a former bank, it looks just the part of course. And the fact that the robbery is all in good fun made it easy for us to approve this production coming in to film.